Here’s a few questions that clients ask time and time again. You can always contact us if you have any additional questions. How much does a trip cost? Wild River Trips are $4595. – $5200. per person per week/ based upon distance from Dillingham and float plane operating costs. View the trip pricing page for more details. Are Wild River Trips appropriate for anglers who have never camped or entry level fly casters? Every year we host first time campers and first time fly casters. The most important quality of a participant is enthusiasm. 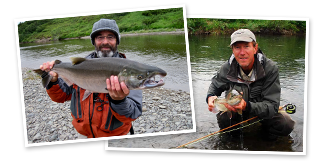 Having said that I will mention that the more fly fishing skill you bring to Alaska, the more time you’ll be hooked up to extraordinary fish. Comparisons are made that a flyfishing trip to Bristol Bay is a pinnacle of wild trout and salmon angling like a pilgrimage to St. Andrews is to a golf enthusiast. Yes, a 50% deposit is required to hold your place on a trip. An email correspondence or phone conversation with Mark will hold your reservations for 14 days. View the deposits & cancellations page for more details. Are Wild River Trips appropriate for outdoorsmen and women in their 60’s and 70’s? We host anglers in their 60’s every week and in their 70’s every season who have come for the trip of a liftime. If mobility is not a problem and medical issues are well managed then spending a week camping along one of the greatest fly fishing rivers in the world is a treasured experience! I’m happy to furnish references and contact information for guests of various ages. When is the full / final payment required? Full payment (the remaining 50%) is required 120 days prior to your trips departure. What address to send payment to? We work with parents to create an outstanding trip for everyone. Safety is always our primary concern. A telephone conversation can help determine if an Alaskan river trip is a great choice for you and your kids. Do you supply fishing gear if we don’t have it or forgot our own? We do have a large cache of gear and supplies available for our clients use. Please contact us ahead of time for any special requests or sizing for gear. You should absolutely read the gear discussion before packing for your trip. What about spinning and conventional tackle? Some of the anglers in my group don’t fly fish. Will they be able to fish with spinning gear? Bring the non fly casters along and let’s transition them to fly fishing, because this is the place to learn to flyfish! The fish are so abundant that even beginners will catch all the fish that they need on the fly. since we release most of the fish -the fly is much less damaging to the mouth parts of the trout or salmon than hardware. The absolute best fishing in my life; super guides who knew how to fish & tremendous food. Jon Trachta. July 17-25, 2014. Goodnews River. Our week was more than a pleasure. It was a really great experience for both me and the boys. Can't tell you how much we enjoyed it! Scott Slappey. Goodnews. July 17-25, 2014.